Adobe Acrobat Reader is free, and freely distributable software that lets you view and print Portable Document Format (PDF) files. Invented by Adobe Systems and perfected over 15 years, Adobe Portable Document Format (PDF) lets you capture and view robust information - from any application, on any computer system - and share it with anyone around the world. Adobe Reader 9 software adds much new functionality, especially relating to collaboration, PDF file creation, security, and an enhanced user experience. Included with Adobe Reader 9 is Acrobat.com (beta), an exciting new set of online services from Adobe. With Acrobat.com, you can create PDF files online; create and coauthor documents with others; host live web meetings; upload and share PDF files and other types of documents and control who has access to them; and even embed a rich, interactive preview of your document in a web page. All of these services and more are provided online, so you can access them from anywhere. And you'll find easy access points from within Reader 9. As an added convenience, Acrobat.com leverages Adobe AIR, so you can interact with Acrobat.com from your desktop. Acrobat.com on Adobe AIR is a small application that is included with your download of Adobe Reader 9. Available in select languages. Improved CAD and geospatial functionality CAD and geospatial functionality have been greatly enhanced in Adobe Reader 9. For instance, CAD designs or geospatial maps that have been converted to PDF offer Adobe Reader users access to CAD features, such as dimensions, or map features, such as longitude and latitude, for powerful collaboration and interaction. · PDF Portfolios provide easier navigation when you work with multiple PDF documents and other document types. Portfolios also enable you to work with a collection of materials such as drawings, e-mail messages, spreadsheets, and videos as a single file, which makes distribution, storage, retrieval, and collaboration easy for end users. · You can also help colleagues, clients, and partners get on the same page at the same time with the ability to conavigate documents. Simply use Acrobat.com services to enable collaboration on a PDF file, and then distribute the PDF file and walk recipients through it in real time by controlling their page view. · As an added convenience, Acrobat.com leverages Adobe AIR, so you can interact with Acrobat.com from your desktop as well. Acrobat.com on Adobe AIR is a small application that is included with your download of Adobe Reader 9. · Adobe Reader can natively display rich media content, enabling a new level of end-user interaction. · Better protect documents, forms, and drawings by leveraging Adobe LiveCycle ES and Adobe Acrobat software. Whether you want digital signatures for authenticity and integrity or document rights management for confidentiality, authorization, and accountability, Adobe Reader is the perfect solution. · View information more precisely and efficiently with the Adobe Reader user interface. Choose the reading mode to fit more content on the screen or the two-up mode to view page spreads without excess space in the middle. Zoom in, pan over, or leverage the loupe feature to take a closer look. · Find and retrieve any PDF document or a phrase within a document in a matter of seconds. Search for words in page content, annotations, bookmarks, form fields, or document metadata within any PDF file on a local computer. · Enable customers to confidently act on information â€' filling, saving, and electronically submitting forms. · CAD designs or geospatial maps that have been converted to PDF offer Adobe Reader users access to CAD features, such as dimensions, or map features, such as longitude and latitude, for powerful collaboration and interaction. 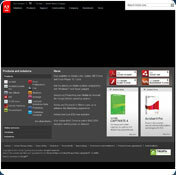 · Adobe Reader MUI is Adobe's Multilingual User Interface version. This product is capable of installing any combination of supported languages. So, for example, you can install French, German, and Spanish simultaneously, and then have the capability to switch among those languages within Adobe Reader. The user interface changes to the appropriate language on the fly. · Quickly manage and control Reader deployments using the Adobe Customization Wizard, IBM Tivoli, Microsoft Systems Management Server, Windows Group Policy Objects, or Active Directory. Centrally host Reader using Citrix Metaframe Presentation Server or Microsoft Windows Terminal Server. · Deliver a reliable experience across operating systems. Reader supports a wide variety of operating systems, including Microsoft, Macintosh, Linux, and Solaris. · Extend the functionality of Adobe Reader using the Acrobat software development kit (SDK), now available free of charge. · Reader helps meet the accessibility requirements mandated by Section 508 of the amended U.S. Rehabilitation Act. Try the Read Out Loud capabilities, or change the reading order of pages or columns after PDF files are tagged to accommodate preferences. · Reader supports the new ISO Standard 32000 for PDF. Also, Reader continues to support PDF/A, the ISO-approved standard for the long-term preservation of electronic documents; PDF/X (printing); PDF/H; PDF/E (engineering); XMP/RDF; and ODBC. You cannot download any crack or serial number for Adobe Reader on this page. Every software that you are able to download on our site is legal. There is no crack, serial number, hack or activation key for Adobe Reader present here. Our collection also doesn't contain any keygens, because keygen programs are being used in illegal ways which we do not support. All software that you can find here is freely downloadable and legal. Adobe Reader installation package is prepared to be downloaded from our fast download servers. It is checked for possible viruses and is proven to be 100% clean and safe. Various leading antiviruses have been used to test Adobe Reader, if it contains any viruses. No infections have been found and downloading Adobe Reader is completelly problem free because of that reason. Our experts on malware detection tested Adobe Reader with various spyware and malware detection programs, including fyxm.net custom malware and spyware detection, and absolutelly no malware or spyware was found in Adobe Reader. All software that you can find on our servers, including Adobe Reader, is either freeware, shareware or open-source, some of the software packages are demo, trial or patch versions and if possible (public domain licence), we also host official full versions of software. Because we want to be one of the fastest download sites on the web, we host all the software including Adobe Reader on our servers. You cannot find here any torrents or download links that would lead you to dangerous sites. Rate Adobe Reader 9.1.2 / 8.1.6 / 7.1.3!